I know JPEG is a "lossy" compression algorithm that discards information in order to save space. What is the visual impact of this? I've heard of "JPEG artifacts". What do these look like? Are there situations where the same level of compression creates more artifacts and looks worse? Does the content of the image matter at all? What does the algorithm handle well, and what does it have trouble with? Assuming JPEG is a requirement, is there a way to reduce artifacts? If I'm uploading to a web service which will apply its own compression outside of my control, is there anything I can do to the image in advance to make it survive this better? general loss of sharpness and oscillations around high-contrast edges: these are due to approximating intensity transitions with smooth functions (cosines); you see them as small "dots" or "halos" around the edges; they are particularly easy to see in the images of text of hand-drawings. blocking structure: image is processed separately for every 8x8 block (or bigger in case of chroma downsampling), block edges become visible at high compression ratios. loss of color detail: it depends on saving parameters, the program may aggressively "downsample" (reduce resolution of) chromaticity channels; it is rarely an issue for the natural photography. As any information loss, you cannot actually recover it. Sharpening may help to recover lost edge contrast, but makes "halos" more evident; denoising may help to remove "halos", but reduces sharpness even further. If block structure is visible, it is probably too late. Just keep the original high-resolution, high-quality images around, and don't overwrite them. choose a service which is known to prefer high-quality JPEG (Flickr, SmugMug, 23hq, 500px) over services which are known to over-compress to save traffic (Picasa, Imgur, Dropbox); usually you get what you pay for. JPEG actually uses two types of compression, a lossly and a lossless one. Lossless compression doesn't cause artifacts, so we can ignore that part. The particular type of lossy compression in JPEG, called a discrete cosine transform for the math knurds, allows a tradeoff between compression ratio and fidelity. Most software sufaces this as a "quality" value, ususally on the 0-100 scale with 100 being effectively no or very little loss and things going down from there. This particular compression algorithm was adopted because it's good at throwing out the kind of things the human visual system doesn't notice as much as other scene components. This is in part why pretty decent looking pictures can have impressively high compression ratios. This is also why it works well on real continuous tone photographs and not so well on synthetic images and line art. The file size reductions were based on JPEG compressions of the whole file so that header structures and other fixed overhead was a small portion of the data. Notice that you have to look to find artifacts in the second picture, even though nearly 4/5 of the original information was tossed out. JPEG compression artifacts are usually most visible at sharp edges and in slowly changing flat areas. Since line art is all sharp edges, JPEG compression is not appropriate for that. You can see the compression artifacts getting progressively worse at higher compression ratios. Keep in mind though that the bottom picture retains a amazing amount of the visual information for having 9/10th of its raw information deleted. The types of artifacts characteristic of JPEG lossy compression are "blockiness" in slowly changing flat areas and "dirt" surrounding high-contrast edges. For example, see the bottom right area in the picture above. That contains out of focus background, so the values are changing slowly. The blockiness is quite evident. 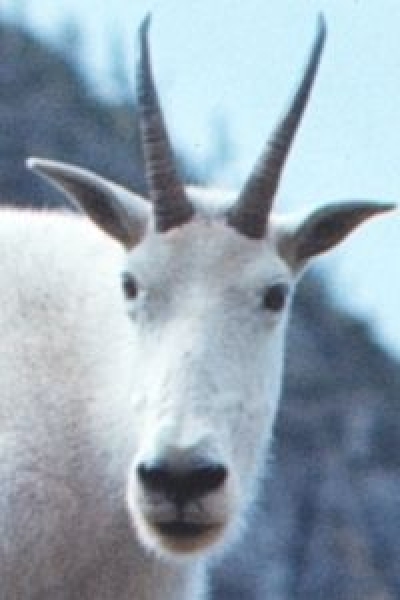 For examples of the "dirt", look around the goat's left horn. These two types of artifacts are usually a strong clue that JPEG compression was envolved. Also look for these in the other pictures above to get a sense for what they look like when they just start to appear, and what kind of compression ratio you might be able tolerate in various circumstances. 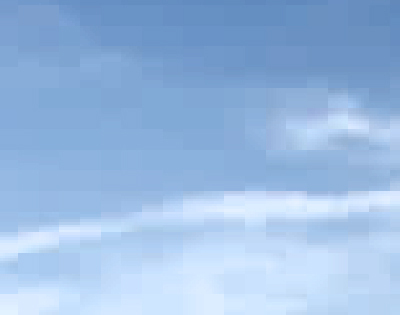 JPG compression is done in blocks of pixels. In a highly compressed JPG image the edges of those blocks can be seen: in the original image two pixels may have been very close in brightness and color, but if they are in different blocks, then after compression and decompression (when viewed) each of their values may differ from the original, so you lose that gradual blending and start to see this "blockiness". 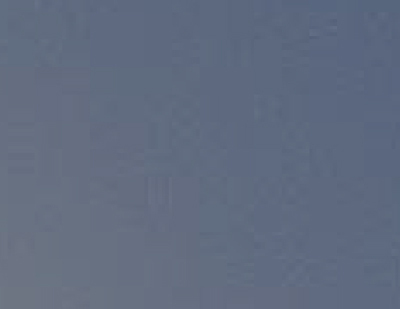 Here is a typical example in a sky - JPG saved at 0 quality. do your own compression to get a smaller file size with good quality. Depending on how the site works, if the image is already small enough it may not do any further compression, or even if it does, it may have a lesser effect. 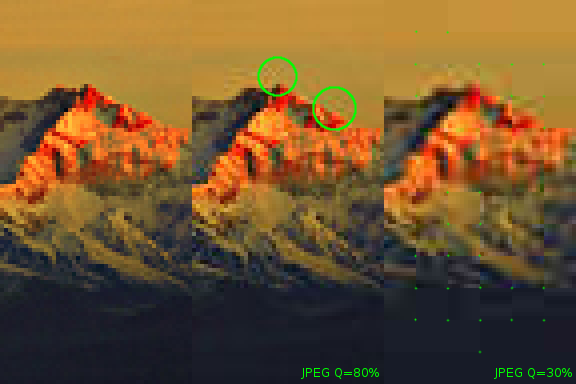 As far as removing JPG artifacts from an image, JPG artifacts can look similar to normal sensor noise. Noise reducing software will be somewhat successful at removing some minor JPG artifacts, but at the loss of detail. Here is an example with JPG quality of 50%, with blockiness, but also darker and brighter pixels which resemble noise. Topaz Labs have a product called DeJpeg, which acts specifically on JPG artifacts. It does a good job of this without too much loss of detail. 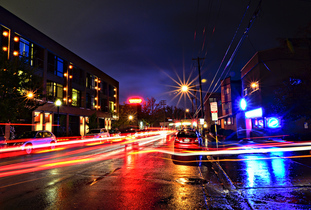 The plugin also can also do some sharpening and general noise reduction. The plugin is compatible with Photoshop CS, Photoshop Elements, and Paint Shop Pro. I don't think it works with Lightroom or Aperture. For websites which compress files until they reach a certain target filesize there is a way you can improve the quality of images in certain circumstances. JPEG works by converting the image into a [series of] frequency space representation[s] (where X and Y represent horizontal and vertical frequencies, and "brightness" represents the amplitude of the frequency). Frequencies below a certain amplitude are ignored, reducing the amount of data that is stored, achieving compression. Noise has a broad spectrum of frequencies that is JPEG can't compress. That's why you can have two images, apply the same level of compression, and get two different filesizes after JPEG compression. If you take your image and intentionally blur the unimportant background areas, you reduce the total amount of information and achieve much higher compression of these areas, leaving you more kilobytes to encode the areas where detail is important. This works particularly well with images in which the background is already out of focus. 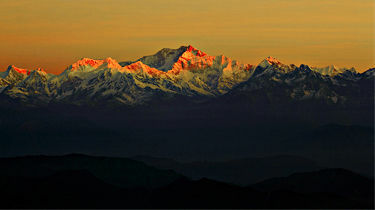 Image by Wikipedia user FelixH. This image is licensed under the Creative Commons Attribution-Share Alike 3.0 Unported license. In this image you can clearly see the so called "artifacts" in the blue area. Note how the image appears to be divided up in blocks, and the block boundaries do not match. The most obvious: do not use jpeg. You may want to work with your images using a lossless compression format, like RAW, PNG or lossless TIFF. You only downgrade to jpeg in the last step, when you want to upload the picture to the web, email, etc. The jpeg format allows for configuration of compression level. You can get less artifacts if you want, but the file will be bigger. Avoid re-saving a jpeg over and over, as each generation degrades the quality even more. Artifacts are the unwanted side-effects of processing an image. In this case, they result from the way data is compressed by the JPEG algorithm. Generally people want to be able to store photos digitally, without using too much storage space. As a result, most photos are stored in the JPEG format. This is a format that compresses the data that makes up the image in a way that attempts to preserve as much detail as possible. The level of compression can be changed when the file is created. However, it is a "lossy" algorithm, which means it discards some data - it's not possible to go back from a compressed JPEG file to the original data. This loss of data comes at the expense of image quality. The compression is designed to create minimal impact on the overall image, but can be noticeable at high compression levels. 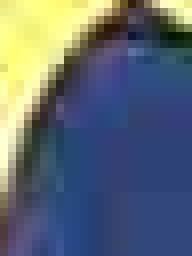 JPEG artifacts most commonly look like blocky sections of colour. They can be seen where there is a subtle graduated colour change in a large wash of colour - e.g. in a blue sky, or a foggy scene. The artifacts look like jagged outlines of a specific colour rather than a smooth blend. With more highly compressed scenes, artifacts can also be seen around the borders of subjects - e.g. a tree's branches against a light sky. These look like blotchy blocks surrounding the subject. Always keep the original image - don't save a compressed JPEG, then re-open it later and re-save. For an extreme example of this, see Generation Loss, a video showing an image re-compressed 600 times. Save as high quality as possible, given any file size restrictions. Avoid using services which severely re-compress your images - if necessary host them elsewhere and link to them directly. Not the answer you're looking for? Browse other questions tagged image-quality jpeg artifacts file-format image-compression or ask your own question. How do I make my photos sharp enough for print or selling online? Why is there too much noise in a fog photograph? Quality of JPEG directly from RAW+JPEG versus JPEG embedded in RAW of RAW+JPEG? Should I care about jpeg2000 (and does anyone else)? Why are JPEG images from camera huge and the same images exported from Vistaprint software 10 times smaller?